I bought a box of organic chestnut mushrooms and every time I looked at them they spoke to me saying ‘mushroom pate’. So I looked up endless recipes on the internet and they all seemed to be basically the same. Chop onions, mushrooms and garlic, and saute gently in olive oil and/or butter. Which I did. Add salt, pepper and herb(s) of choice. I had fresh thyme which I thought would be good. One recipe suggested tarragon which I think would also be nice. Add white wine or dry sherry or any other alcohol of choice, and reduce. And that’s it. When it’s cool blend it. Some recipes suggested serving it warm which I thought was not a good idea. 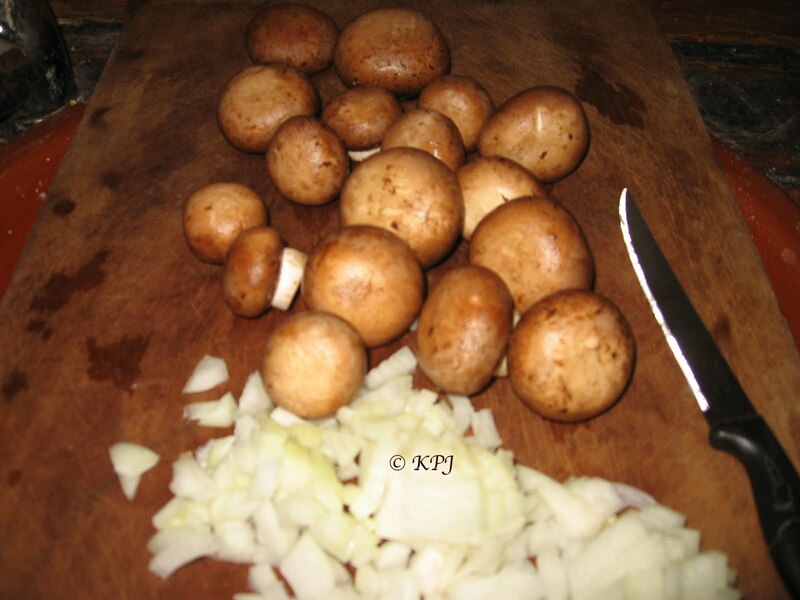 If I want warm mushrooms, they need to be sliced with onions, white wine and parsley. So chill the pate for a short while before you dish it up, serve it. Now, I did read about other stuff you can add – cream cheese, cream, yoghurt etc. I didn’t really fancy any of those, but I can imagine cream cheese might make an interesting addition, especially for texture/consistency. I used half a pound of mushrooms and there was loads, and I mean, loads, of pate. Plus, half a large onion/one small one, and one or more cloves of garlic. Two greedy people managed a huge supper and a huge brunch out of it. Using half the amount of mushrooms would still provide an ample helping. I’m also thinking of adding some black olives to the next version. Didn’t see any recipes including those, but I think it would be a good addition for both taste and texture. Incidentally, serve with lots of fresh lemon, it really needs the lemon to provide that sharp contrast. Ohh … I haven’t any sense reading this one so late at night, but when I saw the recipes heading, I had to look at one, at least. I think I can afford to make this — especially since you say it goes a long way. I might have some for a few days if even if I use less than the half pound of mushrooms. Thanks! Depends how much of a meal you want to make of it, but four or six ounces would do one person for a couple of meals – if you added extras, then four ozs would be plenty. I’ve not made it for a while, so must put some together. So handy to take out of the fridge and eat with toast (and salad). It is pretty easy, although not as easy as olive pate. 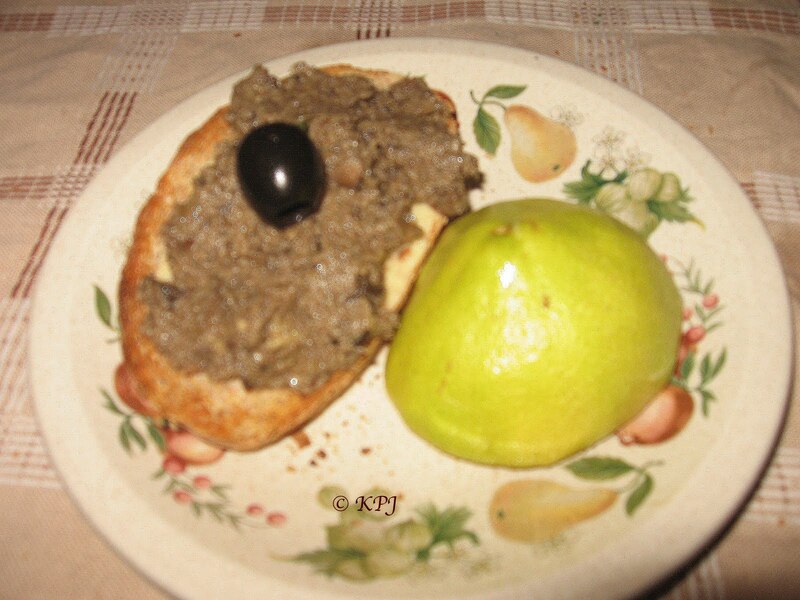 Olive pate? Also known as Olive tapenade? If yes I’d love the recipe!